Should clear wood finishes should be used on exterior wood siding or decks, because few clear finishes offer ultraviolet (UV) protection? 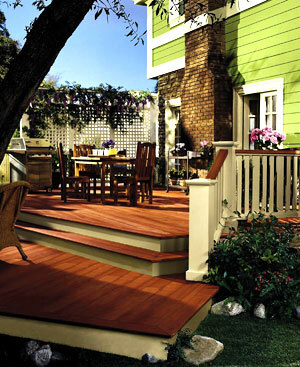 There is lively debate among contractors — and even manufacturers — on whether clear wood finishes should be used on exterior wood siding or decks, because few clear finishes offer ultraviolet (UV) protection. Consequently, they require maintenance more often than finishes that have even a small amount of pigment. The debate continues when it comes to whether one should use oil-based finishes or the newer water-based (waterborne) products being developed to meet increasingly stringent VOC regulations. 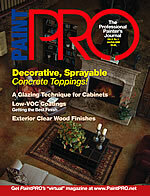 Most of Palmer’s customers don’t want the bother and expense of the annual maintenance clear coatings require. 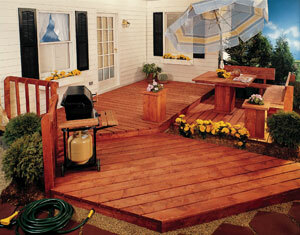 Clear coatings come in waterproofer/sealers, wood preservatives and UV-resistant clears (blocking or absorbing.) Government regulations and technology have brought new clear products to the market. High solids, water-based, oil-emulsion and traditional, solvent-based are just a few examples of clears within each category. According to “Clearing Confusion on Clears,” an informative Cabot Woodcare Technical Bulletin, waterproofing sealers typically contain wax which reduces the amount of water absorbed into the wood, and some resin. None offer protection from the sun’s UV rays. The life expectancy of these products is six months to one year, the same as for the wood-preserving clears, which contain less wax, no resins and an added EPA-registered fungicide. They too, offer no UV protection. UV-resistant clears are usually not “wood-preserving” and only contain a small amount of wax for water-beading. They aren’t truly clear, but have a slight amber color or tone in order to afford some UV protection. They contain dark neutral oils and/or transoxide pigments, which are translucent and show the grain and texture of the wood. The life of these products can range from one to two years on horizontal surfaces and two to four years on vertical wood. Not everybody in the industry uses the terms water repellent and water sealer in the same way, but most seem to agree with Bob Sturgis, vice president, general manager, Wolman Wood Care Products, who says that a water repellent prevents moisture from penetrating into the wood and a water sealer seals out moisture. Jennifer Haney, marketing coordinator for Duckback Products, concurs, with the further explanation that a water repellent has water beading properties and a water sealer protects wood from water damage because it has a breathable finish that will sheet water from the coating’s surface. According to Steve Revnew, director of architectural marketing, residential segments, at Sherwin-Williams, clear coatings offer a high degree of waterproofing with moderate mildew resistance. 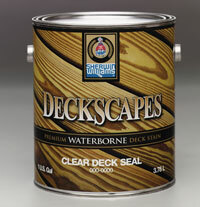 Sherwin-Williams offers a clear waterborne sealing product and two lightly pigmented toners for decks — one waterborne and one oil-based — as part of their DeckScapes line. The toners are lightly pigmented and will improve the appearance of weathered wood as well as waterproof it, so they are slightly more durable than a clear sealer. The company maintains that most waterborne coatings meet or exceed performance requirements set by older, oil-based stains. 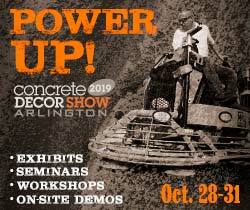 “With proper education, contractors will become familiar with the advantages of waterborne products,” Revnew says. The Flood Company’s CWF-UV5, a penetrating oil finish, darkens when applied and then lightens, depending on the intensity of sun exposure. A new product, Supreme Performance, is a fast-drying, long-lasting, deep-penetrating water-base coating that is available in a clear finish. Gary Finseth, vice president of marketing, claims that Supreme Performance’s unique waterborne system enables it to penetrate as well as oil but not burn off. 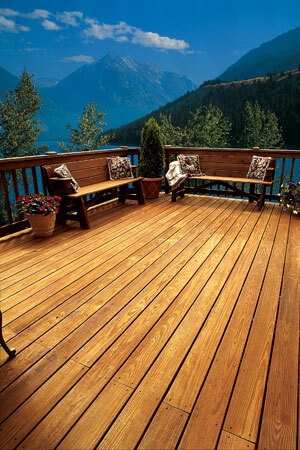 It is especially formulated for challenging surfaces and conditions, such as exotic hardwoods, as well as high-altitude locations. Many products being marketed as clear have some tint to them, according to Wolman’s Sturgis. But Wolman Raincoat Water Repellent is a totally clear, water-based product that meets all VOC requirements and federal guidelines for water repellency. 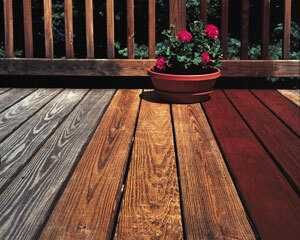 “There’s a real difference in Armstrong’s Clear,” Clark says, “because it meets all VOC regulations yet remains thin and easy to apply.” This is a wood treatment product made up of heavy- and light-bodied conditioning oils that combine with a solvent substitute to deeply penetrate into the wood. The substitute is a non-drying conditioning oil that soaks down into the wood to improve the condition of the wood instead of evaporating up into the air. Clear water repellents have their place in the market as long as the customer either wants the look of gray, “weathered” wood or understands that using it comes with the cost of annual upkeep. As to whether water- or oil-based products are better? It depends on whether the weather is rainy or sunny for ease of application and the personal taste of customer or contractor. Got an opinion on using clears, or on oil-based vs. water-based wood finishes? E-mail your two cents to our editor.